Wednesday 28th May was a day of drizzle rain so not the sort of conditions that people would choose to go on a tour of Greenwich Park. That said sixteen brave Ace of Hearts members decided to do just that. With a gap in the weather it was agreed to do the outside tour first before going into the Observatory. Passing the Peter Harrison 120 seat Planetarium, our guide Roger told of the fantastic computer generated shows, or as the advert says ‘Think of a planetarium as a tour bus of the Universe.’. There are several shows every day and it’s well worth a visit. Phil took loads of photos throughout the tour. Onto Saxon tumuli graves or as we saw several large earth mounds which were all that was left of the fifty original tumuli. 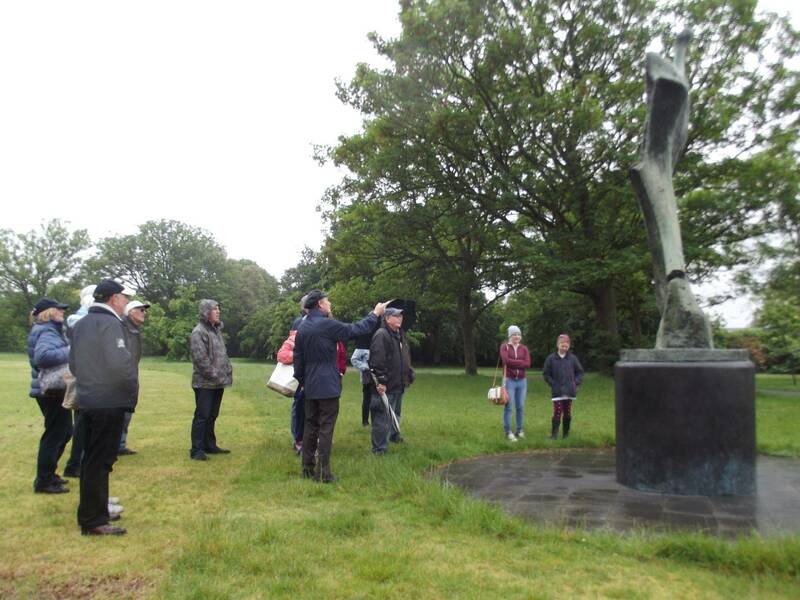 Nearby was a large bronze statue by Henry Moore called Standing Figure Knife Edge which was stimulated by Henry looking at the bones of a small bird, nuff said. Onward through a gateway to near the Chesterfield Walk road to see Macartney House (no not that Macartney Steve) where James Wolfe lived as a child. Then to the glorious Rangers House of about 1720 which now holds the Wernher Collection of medieval and Renaissance works of art (as seen by some through a window). Back into the park to see the Rose Garden with over a hundred types of roses, mostly still in bloom. Montague House home for a few years to Queen Caroline of Brunswick should have come into view at this point but unfortunately George lV had it knocked down in an act of revenge. Sad story of Caroline who married the wrong bloke, a selfish, gambling, womanising rogue who in any event happened to be already married to a Mrs Fitzherbert. Saying that he did build the Brighton Pavilion and do up Buckingham Palace so he wasn’t all bad. After a cup of coffee and an expensive snack in the park Pavilion there followed a quick visit to the Observatory. Now damp and exhausted the party dispersed in reasonably buoyant mood to find their weary way home. Roger thanked the group for their dedication in staying the course through rain and bad jokes.